Denise performs the accounting functions for the Academy including Member account maintenance and payment processing. Denise started working in the accounting field while she was still matriculating. She brings extensive accounting experience to the Academy, including a stint as a Worker’s Compensation Insurance Auditor for the State of California. She also owned her own company, providing accounting services to small businesses. 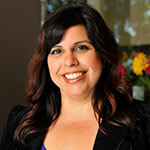 Denise attended California State University, Fresno, earning a Bachelor’s degree in Accounting. Denise loves the beach and enjoys spending time with her family and friends. She also admits to having a “mini-compulsion” for shopping!